Pericytes are contractile cells that wrap around the endothelial cells of capillary and venules throughout the body. Pericytes are embedded in basement membrane, where they communicate with endothelial cells by means of direct physical contact and paracrine signaling. In the brain, pericytes help sustain the blood-brain barriers, which regulate capillary blood flow, the clearance and phagocytosis of cellular debris and the permeability of the blood-brain barrier. Pericytes deficiency in the central nervous system can cause the blood-brain barrier breakdown, leading to neurodegenerative diseases. Figure 1. 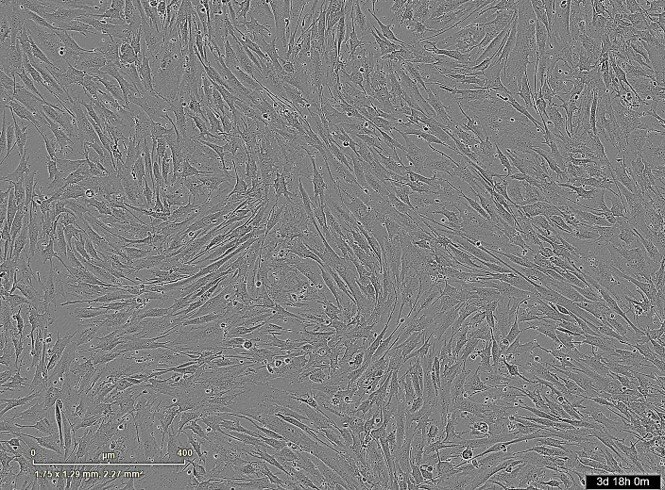 Phase contrast image of Human Brain Vascular Pericytes. Figure 2. 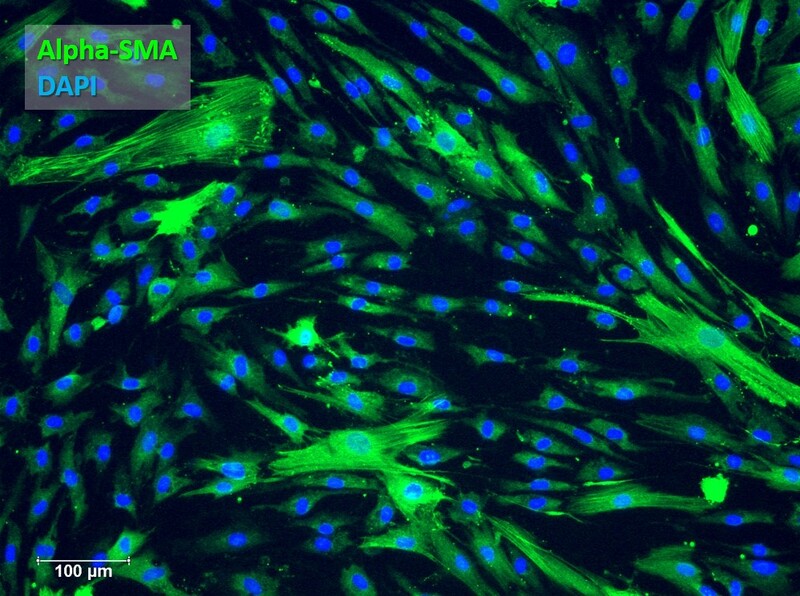 Immunofluorescence staining of Human Brain Vascular Pericytes with Alpha-SMA antibody. iXCells Biotechnologies provides high quality Human Brain Vascular Pericytes (HBVP), which are isolated from human brain and cryopreserved at P2, with >0.5 million cells in each vial. These HBVP are negative for HIV-1, HBV, HCV, mycoplasma, bacteria, yeast, and fungi. They can further expand for 10 population doublings in Human Pericyte Growth Medium (Cat# MD-0030) under the condition suggested by iXCells Biotechnologies. Birbrair etc and Osvaldo. Role fo pericytes in skeletal muscle regeneration and fat accumulation. Stem Cell and Development 2013, 22(16): 2298-2314. Bergers G and Song S. The role of pericytes in blood-vessel formation and maintenance. Neuro-Oncology 2005, 7(4): 452-464.